Commercial or residential no job is to large for us. We offer a disposal pick-up service including the supply of bins for your convenience. Call us to arrange. QB Copper Recycling is a leader in commercial metal recycling. We have over 15 years in the industry, taking our knowledge and providing our customers with the best possible services. We serve endless commercial businesses with a convenient and profitable solution for their ferrous and nonferrous scrap metals. We recycle the metals. With QB, a cash payment for your scrap recycling is on its way. We supply bins for scrap collections, delivering and picking up the bins in Perth. We provide scrap pick up Perth for our commercial clients that cannot make it to our Bentley yard. We provide upfront payments for scrap recycling. We recycle ferrous and nonferrous metals using the best identification and sorting technology on the market. We also pay current metal rates. With our team’s experience and equipment, we can provide an evaluation of your metals over the phone, as well as onsite. We specialise in working with commercial disposal, so we are the professionals for your commercial scrap. Recycling helps to create a green environment. You may not think much to loading up a truckload of scrap and disposing of it in a landfill. You should think again. There are so many items that are disposed of in a landfill that could be recycled. Recycling spares the environment of greenhouse gases and conserves energy. Recycling ferrous and nonferrous scrap is doing your part to help to keep Perth green. Ferrous metals include steel, cast iron, and mixed iron. Nonferrous metals include carbide, brass, aluminium, copper, lead, stainless steel, and more. With QB Copper Recycling, you have a recycler that pays you cash for scrap metal recycling Perth. 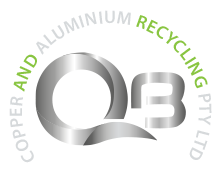 QB Copper & Aluminium Recycling is among the largest recycling yards in Bentley. We accept commercial metals in our yard, as well as provide our customers with scrap metal pick up Perth services. Whether getting rid of aluminium ladders, equipment, cars, or construction waste, we provide the recycling services you require. Our yard is designed for the convenience of commercial businesses & professionals. We provide an easy drop off the metal scale in a clean and safe environment. With a friendly and knowledgeable staff that is ready to assist you, you have the exact service that you require. Your commercial scrap metal needs are catered to. We will come to your location in Perth to weigh and remove your commercial scrap. You receive an upfront payment for your commercial scrap. We provide scrap bin services with bins specific to your scrap needs. For more information on our services, or to discuss bin service or you scrap waste, please contact us at the number below. To contact us online, please complete our “Enquiry” form at the top right of this page.